You cannot add "Dead Can Dance: Dionysus (Book, CD & Vinyl LP) (w/Lisa Gerrard)" to the cart because the product is out of stock. From their inception in 1981, Australian duo DEAD CAN DANCE have long been intrigued by European folk traditions, not solely in musical terms but also by secular, religious and spiritual practices. Taking its inspiration from this backdrop DIONYSUS was shaped as Brendan Perry explored the long and established spring and harvest festivals that originated from religious practices, a journey that brings to the fore, the rites and rituals that are still practiced to the present day. Two years in the making, Perry has amassed an array of folk instrumentation and as often heard on previous albums takes inspiration from across the world, tracks evolve less like songs but more akin to fragments of the cohesive whole. Dionysus follows a familiar path, witness to field recordings, that includes chanting, beehives from New Zealand, bird calls from Latin America and a Swiss goatherd. The aim in Perry’s mind is to not just invoke the atmosphere and symbolic reference points but to highlight that music can be found everywhere in some form or other. The album consists of two acts across seven movements that represent the different facets of the Dionysus myth and his cult and takes the musical form of an oratorio, which has informed both spiritual and secular pieces of music as far back in history as the early 16th century. Retaining a prevalent hold on contemporary paganism in Europe, the voices used on these movements are imagined as communities celebrating, in communion with each other at times, chanting and call and response – the various voices are present to convey emotion beyond the boundaries of language itself. 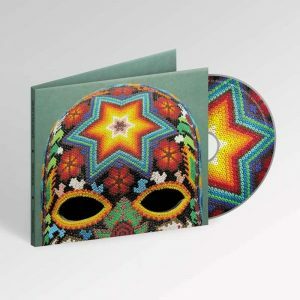 Although taking its main inspiration from the Dionysus story, the album’s artwork resonates with links to rituals depicting a mask made by the Huichol of the Sierra Madre Mountains in Mexico – famed for their beadwork and yarn paintings, whilst also partaking in peyote as a sacred rite and ritual for the purposes of healing and mind expansion – this is at the heart of Dionysus, a celebration of not just humanity but humanity working hand in hand with nature with respect and appreciation. A full list of all Lisa Gerrard albums available from the Projekt webstore.